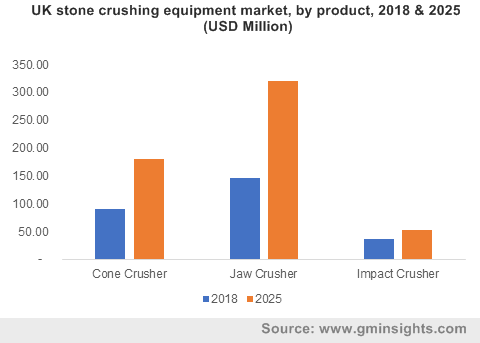 Stone Crushing Equipment Market size was valued at over USD 4.5 billion in 2018 and will grow at a CAGR of over 8% from 2019 to 2025. 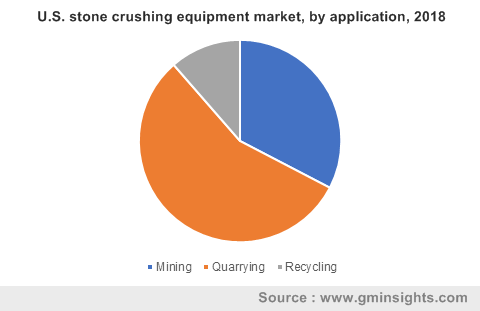 The growing adoption of stone crushers in various sectors such as mining, infrastructure & building, highways and railways, will drive the stone crushing equipment market growth over the forecast timeline. The surge in mining activities in Asian economies has resulted in the increased utilization of this machinery in the region. Continuous development of roads and highways due to the increasing transportation activities across the globe, will contribute to the market demand. The rise in the number of high-rise structures in countries including the U.S. and Canada will increase the demand for crushing machines in the region. The machinery is used at construction sites to crush bulk stones into various material sizes reliably and efficiently. However, factors such as high cost of stone crushing equipment, lack of skilled operators, hazardous emissions and noise pollution during the operation of machines is anticipated to hinder the market demand. Jaw crushing equipment is expected to grow at around 10% CAGR from 2019 to 2025. It is commonly used in various industry segments such as construction, metallurgy, and mining, for crushing different materials such as rocks, marbles, granite, iron ore, and copper ore. The jaw crushers are used by contractors due to its easy maintenance and simple design features. These machines can be easily relocated for service & maintenance purposes, which reduces the overall operational cost in a project, thereby contributing to the stone crushing equipment market growth. Due to the advantages of jaw crushers, such as convenient operation, high efficiency, and durability, their demand will increase significantly over the forecast timeline. Mobile cone crushers are gaining popularity in the stone crushing equipment market due to their applications in various areas such as rock crushing and mining, mobility feature that helps them to move anywhere and start working instantly. These machines are flexible and easily adapted, thus increasing the overall productivity at the construction sites. The stone crushers are widely used in various material processing operations in the mining and construction applications, adding up to the stone crushing equipment market growth prospects. Increasing government spending in emerging economies including China and India for the development of roads and highways will contribute to the stone crushing equipment market development. For instance, the Government of India has initiated a road development program for North East India. Phase A of the project includes upgrading of 4,099 km of roads with a budget of around USD 3.3 billion, which is to be completed by the end of 2021. The utilization of these machines in the mining industry is gaining popularity due to their ability to crush granite, marble, basalt, cobble, iron ore, copper ore, and some other mineral & rocks. 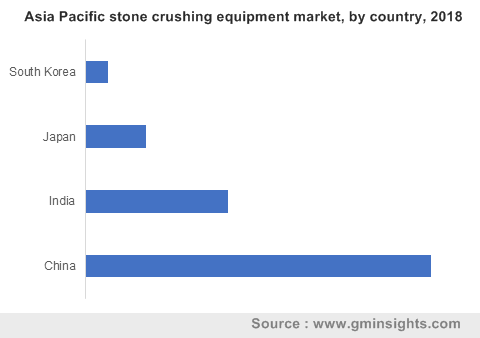 The Asia Pacific stone crushing equipment market was valued at over USD 2 billion in 2018 and is anticipated to witness growth considering the rising urbanization, increasing investments in the infrastructure and mining sector. As per the Asian Development Bank data, the Asian region will need to invest USD 26 trillion from 2016 to 2030 to maintain the growth momentum. China has several ongoing construction projects, including Belt and Road Initiative with an investment of approximately USD 900 billion. Moreover, numerous long-term & short-term projects undertaken by the public & private sectors of India are further attributing to the market growth. The growing construction activities in the Asian countries will increase the demand for crushed stones at sites, thereby driving the equipment demand in the region. 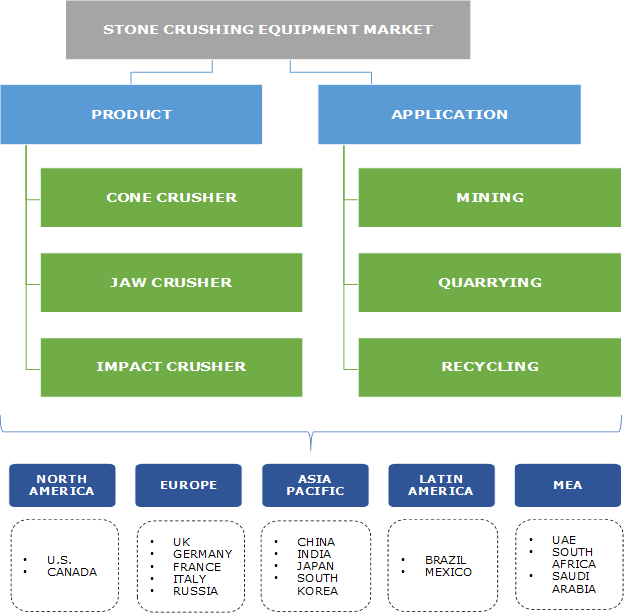 Leading companies operating in the stone crushing equipment market include Mesto Oyj, Terex Corporation, Astec Industries, Sandvik AB, Komatsu Ltd., Thyssenkrupp, Eagle Crusher Company Inc., IROCK Crusher, etc. The companies are involved in regular innovations and new product introduction strategies to offer differentiated machines to a wide range of customers and to gain a competitive edge. Players are also incorporating advanced technical features into the new products to deliver high performance & productivity across the application industries. For instance, in April 2018, Mesto introduced MX3 crusher to its Multi-Action cone crusher series at Bauma 2019. The MX3 is designed for safe and easy operation with the incorporation of Mesto IC(TM) series automation system. In October 2017, Thyssenkrupp developed ERC25-25 crusher having the throughput of up to 3,000 tons per hour as a step towards enhancing the company’s product portfolio. The stone crushing equipment market is fragmented in nature due to the presence of several major construction & industrial machinery manufacturers across the globe. The leading players operating in the industry are adopting strategies such as mergers & acquisitions, partnerships, and new product development to expand their business reach. The global players are increasing their distribution network to cater to the large customer base across the globe. For instance, Sandvik Mining and Rock Technology appointed Bergerat Monnoyeur (BM) as its sole distributor for mobile crushers in mainland France during March 2019. The stone crushing equipment market is also witnessing a huge demand for rental models due to the high initial costs of these machines. Renting these machines has various advantages such as avoiding initial purchase cost along with depreciation and maintenance cost.